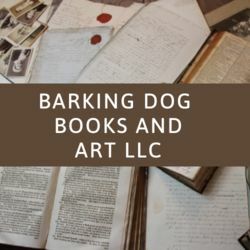 Barking Dog Books and Art LLC has been selling used and unusual books online since 2002. Your order will be processed and shipped promptly with delivery confirmation. Thank you for visiting our profile. We are a home-based business. We have been selling online since 2004 and on Biblio since 2008. Feel free to e-mail us at [email protected] We would be happy to assist you. Please note that we ship all "Standard" items via US Postal Service Media Mail and all "Expedited" items via US Postal Service Priority Mail as suggested by the Amazon.com Shipping Guidelines for Marketplace Sellers. Our international orders go via Air Mail (US Postal Service International First Class), but we try to upgrade to Global Priority (US Postal Service International Priority) when possible. If you would like us to ship an item via another carrier, please e-mail us and we will try to accommodate you. We ship orders every day, Monday through Friday, (excluding Postal Service holidays) usually by 12PM. If you need to cancel or make changes to an order, please do so as soon as possible -- many requests we get regarding orders are not fulfilled because we find, pack, and ship the book before the buyer contacts us. If you receive a confirmation e-mail from us, it means your order has been shipped and we can no longer make changes to it. Please note that the majority of our orders ship out within 24 hours, many shipping out the same day they are ordered. Since we usually ship around 12PM, most orders received Friday after 10AM will not go out until Monday. In some cases, we will make a trip on Saturday to get more orders out. The majority of our packages are shipped using Stamps.com NetStamps, a non-trackable method. Please note that all items ordered via the "Expedited" shipping method are automatically shipped with Delivery Confirmation. If you would like your item shipped with Delivery Confirmation, please e-mail us before making your purchase. Books & Bidders deals in general antiquarian, private press, scholarly and out-of-print titles. We are a member of IOBA (Independent Online Booksellers Association). We are always buying books of consequence. We are hobbyist in books. We often go to auctions and buy entire box lots of books for a few of the finds. We then try to pass on the books that others may want on this site. �Buckeye Bookshop is an open shop (Monday-Saturday, 10 a.m.-6 p.m. Closed Sunday). Our inventory includes approximately 45,000 hardcover and trade paperback volumes and 9,000 mass market paperbacks. While our inventory is general in nature, we maintain an emphasis on modern first editions. We offer quality vintage cookbooks & antique kitchen wares. Dale's Decoy Den specializes in hunting titles including big game, African, upland game birds, waterfowl, both new and out of print. Amwell Press titles are a specialty of the Den, as are books on collectible sporting items. Most of our books are first editions in very good, or better, condition. We also stock hunting sporting collectibles: duck and goose decoys; duck, goose, crow, turkey and predator calls; shotshell boxes; ducks unlimited buttons; limited edition sporting prints, and the like. We are also an importer of fine Grulla side by side game guns. Can we order one for your? We have been in business for over 30 years. Our company was launched based on the fundamental belief that used books have value and should never go to waste. Prior to our founding, many of our staff worked in the thrift industry where we saw millions of books being sent to landfills each year. With each discarded book, we thought of the imagination, magic, and knowledge lost forever to a garbage heap and we endeavored to find a better way. We think books should achieve their greatest possible purpose: Whether purchased by another reader, donated to help a child acquire the lifelong skill of literacy, or recycled as a new product, it has a story to tell. We let stories live on. Duttenhofer's Books is a large open shop with more than 40,000 volumes of quality old, used, and rare books. We have been in business more than thirty years, and have been selling on the internet since 1998. Quality used books at a reasonable price, We ship within 24 hours Monday through Saturday. Each book in our ever expanding collection is individually selected by the owner. 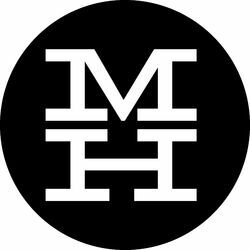 We specialized in collectibles, first editions, put of print, signed copies, medicine, philosophy, music, ephemera, poetry, art, literature. Browse our online inventory to find something special and unexpected. Speedy Books is a specialist online bookseller with over 200,000 titles to choose from. All our books are in brand new condition and cover a wide range of genres. 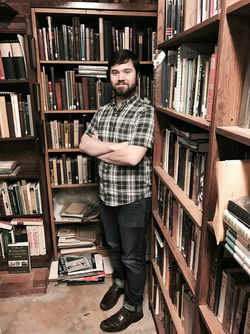 An online seller of scarce and rare books. Offering a modest selection of books relating largely to early explorers. 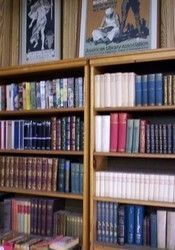 Jaguar 10 Books has owned an Internet bookstore for over 14 years-We stock over 8,000 used books including Antiquarian, History, Science Fiction/Fantasy, Young Adult and Children's books, Self-Help, New Age/Occult, Religious, General Fiction and Non-Fiction. We occasionally offer auction sales on eBay & other venues. Kolbe & Fanning Numismatic Booksellers are the largest firm in the world specializing in rare and out-of-print numismatic literature. Drawing upon decades of experience, we buy and sell books, catalogues and periodicals in all languages and from all time periods. We regularly conduct mail-bid and public auction sales and also sell numismatic books directly online. Please feel free to contact us if we may be of assistance in building or disposing of your library. We are members of the International Association of Professional Numismatists (IAPN). Generalist concern with developing specialties in vernacular photography, transportation, and the Midwest. Small bookstore in the village of Mingo Jct. Ohio..Right smack dab between the two stop lights...Life long Mingo Jct. resident. Graduated Mingo High-1961, West Liberty State College-1966, West Virginia University-1970We support the WLSC "Hilltoppers", WVU "Mountaineers" and OSU "Buckeyes" Mingo Jct. 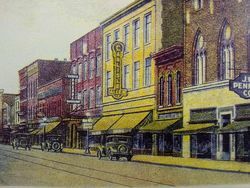 is the home of the 1978 Oscar award winning movie "The Deer Hunter"So, if you viewed the movie, you have seen Mingo Jct. All the local and steel mill scenes filmed right here in our local Wheeling Pittsburg Steel plant which is still producing high quality stainless steel ! Bob Parissi of Wild Cherry-"Play That Funky Music" fame is a 1968 Mingo High grad. Joe Fortunato 5 time All Pro outside linebacker[1955-1965] for the Chicago Bears also 1948 Mingo High grad. Mingo was also Wayne Woodrow "Woody" Hayes the legendary Ohio State football mentor's very first coaching job..Tis true, check out any of his bios..We also have the "mandatory" cat Two Sox on 24 hour guard duty. Only allow PRE 1964 music to be played in shop. NO BEATLES! Doo Wop music only..If you would like a free copy of our new MINGO WALL OF SOUND Doo Wop CD entitled "Back To School" just request and we will send out a copy with your book order. Please, for Doo Woppers only..We are temporarily out of "shrunken heads" and fuzzy dice..Suicide knobs are still on back order. Internet book store where many books were in pastors' libraries. These pastors are retired or with the Lord who redeemed them, as they had put their trust in the Lord and Savior Jesus Christ. We sell general interest type titles with no specialization in catagory. About 75% of our titles are first editions and about 25% of those are signed. We also sell audio titles. We have ephemera related to publishing.We add to our inventory every day.Enjoy browsing through our titles! Also specializing in: 17th-19th North American Century History And Religion. Former open shop established with same owner since 1976. Once Upon a Thyme Bookshop is a bookstore in Beavercreek Ohio that specializes in cookbooks, new and used, specialty kitchen items, unique gifts, vintage kitchen gadgets, and culinary classes. Proudly helping to keep quality used books in circulation. We are an Internet Bookseller and have been in business since 1996. Passenger Books, a collection of fiction and nonfiction materials to supplement your already accomplished life! Community book store carrying a large selection of used books, old advertising and locally made items. 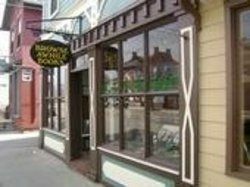 Quaint Book Shop is an online bookselling service that features regional and local history, classic children's and religious books and specializes in Kenneth Roberts books. 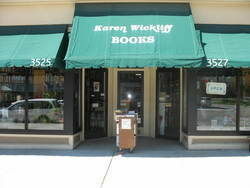 We are a used book store - carrying all genres of books. From my personal library collection. 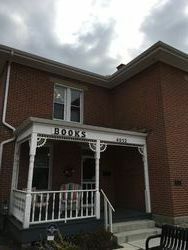 A charming used bookstore in a renovated building in beautiful Downtown Barberton, OH. 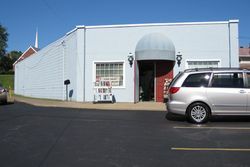 A general bookstore with over 1000,000 volumes of very nice condition hardcover and paperback books in all categories. Store hours are Mon-Fri 10-6, Sat 10-4. Just a casual book collector who understands the trade. Stories & Sequels is here to provide you with your next great read. 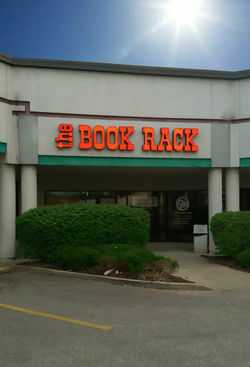 A book lover's delight since 1976 and in the same place since 2002, The Book Rack offers used and new books in a wide variety of genres. Browse to your heart's content. Thunder Promotions is an online sales organization specializing in collectible books and magazines. We have a large collection of Old West, True West, Frontier Times and others at competitive prices. We also feature a variety of books, many of them collectible manuals, programming books, etc., related to computers and software programs. Our main website can be found at www.TpromoCom.com and our western magazine blog can be found at www.WesternMagazineDigest.com.